In case you missed that middle part, I'll repeat it. This is a no-cook sauce. Yes, no cooking, just chopping. Because you know I'm all about keeping dinner simple, healthy and delish. And we all have time for a little chopping. And anchovy-mashing, which is really quite fun and a pretty good arm workout. 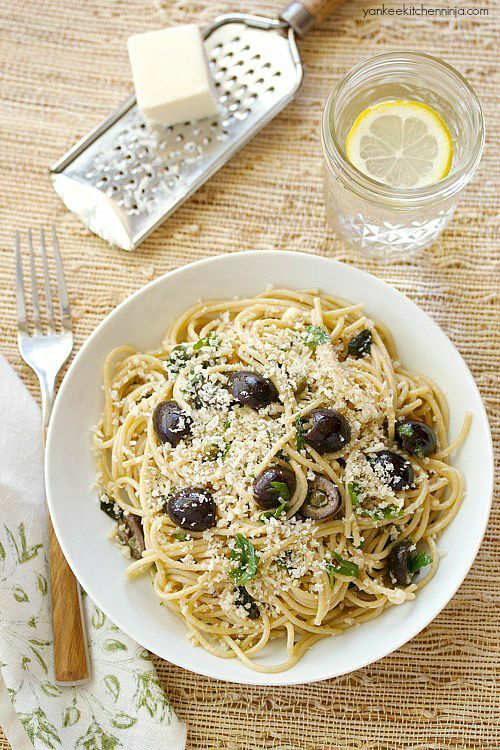 In addition to making my Mediterranean pasta with no-cook olive sauce, you can find other ways to incorporate California Ripe Olives into your daily diet by checking out this site. 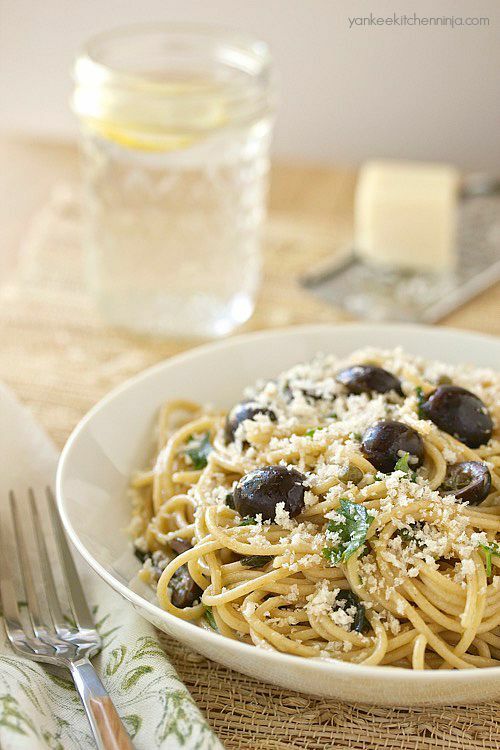 And whether you're a long-time olive fan or just warming to the idea, here's an extra bonus: you can enter the California Ripe Olives Mediterranean Midsummer Giveaway for a chance to win a fabulous prize package that will help you enjoy Mediterranean meals at home all summer long. Are you on the black olive bandwagon with me now? Raise your olive-tipped hand if you are. 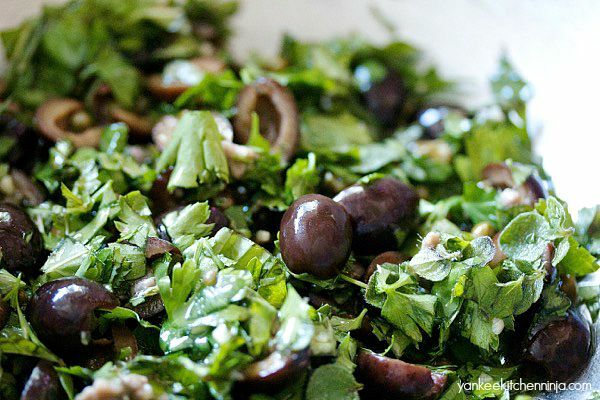 Then leave a comment (you should probably remove the aforementioned olives first): The Ninj wants to hear from fellow olive lovers. 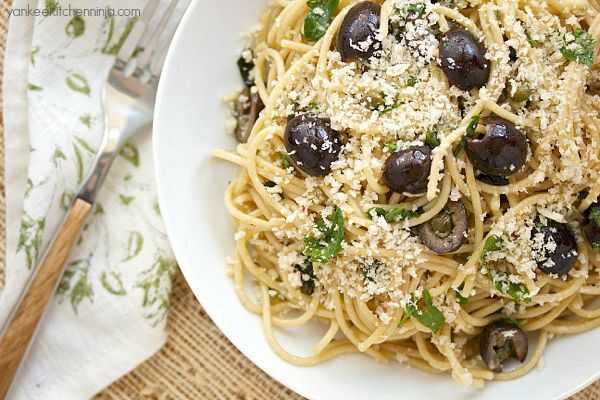 While pasta cooks, combine the garlic, parsley, basil, oregano, olives and capers in a large bowl. On a cutting board, use the side of a large chef's knife to mash the anchovies into a thick paste, then scrape the paste into the bowl. Add the olive oil and mix thoroughly. Next, add the cooked, drained pasta and about 1/4 cup of the reserved cooking liquid to the bowl, and toss to coat (add a little more pasta water if necessary). Sounds delicious. Might try this out tonight. I am scared of anchovies but love fish. Oh, don't fear the anchovy! They are great and, as a paste, you won't even know they're in there. ENJOY!